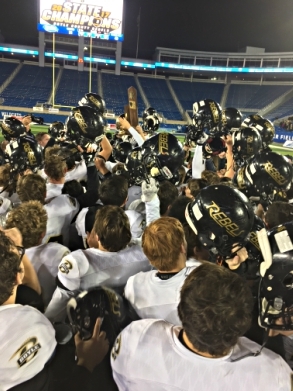 Boyle County celebrated its 8th state title after beating Corbin 40-21 in the Class 3A title game at Kroger Field Friday night. Reese Smith, one of the brightest stars in Boyle County’s 40-21 victory over Corbin in the Class 3A football finals Friday night, is no relation to Rebels’ coach Chuck Smith. But the sophomore wide receiver/free safety, who accounted for four touchdowns in Boyle County’s rousing win in front of 11,234 at UK’s Kroger Field, has known his coach for a long time. Reese Smith wasn’t alone in his thinking. Chuck Smith and Boyle County go together like championships and trophies. Smith built the Rebels into a state powerhouse in the late 1990s and guided them to five consecutive state titles from 1999 to 2004. He got Boyle County back in the finals in 2005 but the Rebels were runners-up to Highlands. Smith then left to become an assistant coach at UK, his alma mater, and stayed there eight years before Joker Phillips’ entire staff was let go after the 2012 season. After a year away from the game, Smith yearned to get back on the sidelines, and in January of 2014 he signed on to coach at Madison Central. Less than three weeks later, however, the Boyle County job came open when Larry French, who had guided the Rebels to back-to-back state titles in 2009 and 2010, resigned to take over at Pulaski Southwestern. Smith couldn’t resist the siren call to return to Boyle County. He told Madison Central he had had a change of heart and was going to rejoin the Rebels. It took four years, but Smith has Boyle County back on top, and nobody’s surprised. Standing at the 50-yard line at Kroger Field Friday night, as his Rebels celebrated the school’s eighth state title, Smith was asked if this is what he had in mind when he returned to Boyle County in 2014. Chuck Smith was all smiles after winning his sixth state title at Boyle County. “This is exactly what I wanted,” he said, but added that he knew it would take a little while to get the program back to championship level. “(The players) didn’t get what I was saying, or what my philosophy was, until this senior group,” he said. And what is that philosophy? Chris Pardue, who was Smith’s assistant during Boyle County’s run of five straight titles, rejoined his buddy in 2015 to again serve as offensive coordinator. Did Pardue foresee another championship happening? “We were hoping,” he said. “You can’t take anything for granted. But we knew everything was in place to get us back here. “The big thing was, we had to get the kids to believe in themselves, and to get used to Chuck. He’s a different cat. He’s intense all the time with everything he does. He pays such attention to detail, and he gets the kids focused. Will Bramel, one of several senior linemen who keyed the Rebels’ championship run, was a freshman when Smith returned as coach. He admitted there was a learning curve. “With him as coach, it’s more than just hitting and hitting and hitting,” Bramel said. “We had to build a culture, to play with discipline for four quarters, and that’s what we had to do tonight. Brandon Smith, the coach’s son who was an all-state quarterback during the Rebels’ string of championships, was on hand Friday night to watch his dad celebrate another title. Brandon, now a successful coach at South Warren High School in Bowling Green, said it’s hard to explain his dad’s winning formula. “Unless you’re around it, you don’t understand it. It’s a different level of intensity. He’s just consumed by it and everybody around him gets consumed by it. While Boyle County’s senior linemen set the table in Friday night’s finals, a talented group of underclassmen filled the skill positions. Reese Smith had 5 catches for 120 yards and 3 TDs, and also returned an interception 40 yards for a score. Sophomore quarterback Reed Lanter threw for 223 yards and 5 TDs. Sophomores Reiley Colwick and Landen Bartleson each caught a TD pass. Junior Tanner Crawford was the Rebels’ leading rusher with 92 yards, and Bartleson had 88. Chuck Smith now has an overall record of 184-43 in 17 seasons at Boyle County, highlighted by six state titles. And with the talent returning, the Rebels will probably be favored to repeat as champ next year. But Smith won’t worry about next season until, oh, maybe next week. For now, he’ll enjoy getting Boyle County’s latest championship. “This one is my favorite right now because it’s the last one, and I hadn’t done it in a long time,” he said. “And these kids had never won one, so I wanted so bad for them to win a state championship.